I wanted to add a little Fall flare to my daughter's nursery, but didn't really want to go with autumnal colors. Instead, I kept it fun and fresh. Just like my lil' punkin! This was a very inexpensive project. 3 bucks plus my own supplies. Not too shabby! I picked up 3 plasticy-styrofoamy (technical term) pumpkins at my local dollar tree. 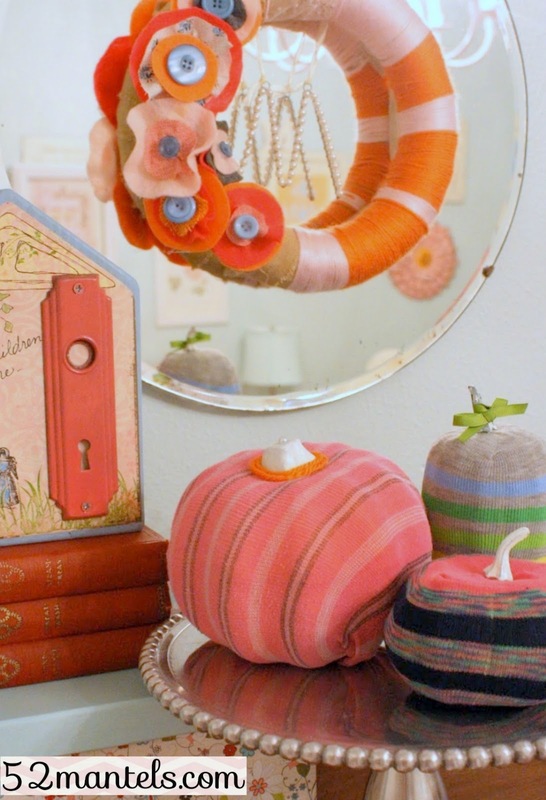 I paired those with some colorful socks from my stash and made a cute, little vignette for punkin's dresser. First, I removed the stems from the pumpkins (I had to cut off the orange pumpkin's stem) and sprayed them white. For the two green pumpkins, I slipped a sock over the pumpkin, leaving the toe seam on top. Then I trimmed the excess fabric around the bottom. You can cover the opening with a round of felt...or, you can leave it as is. Really, who's going to see the bottom of your pumpkin? For the larger (orange) pumpkin, I had to slip it into the sock sideways. Then I gathered the two ends and tucked them under the pumpkin. Go ahead and hot glue the ends and cover with another round of felt. If you must. Or don't. I won't look. Now, stick your stems back on the pumpkins and display. How easy is that?? Oh, I guess I should talk about that orange pumpkin. Since I cut the stem off, I had to reattach it with a long, straight pin. Which is why it has a pearl top. And, I covered the ugly seam with a strand of orange yarn. Again, how easy is that?? Your pumpkins are adorable and I love the name of your blog. Wish I had a mantel. =( Coming over from Transformation Thursday and a happy new follower! What a great idea! So cute and creative!!! Thanks for stopping by BPPackages and following! Happy to follow you back! I love these! I would love to feature this on Reduce, Reuse, Upcycle. Feel free to stop by and grab a featured button. Thanks! 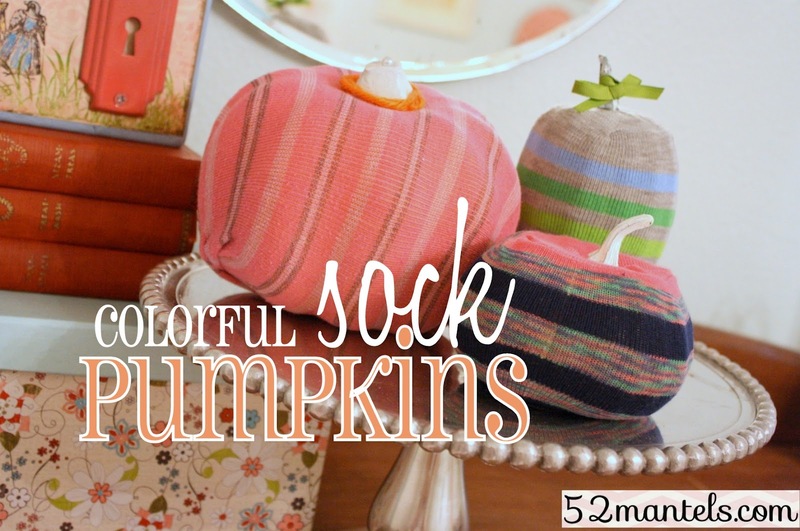 There are always an odd sock and this is a really cute idea. thanks for sharing! Lydia told me about your blog...I'm friends with Amber, too! You have so many creative ideas...I'm your newest 'follower'. 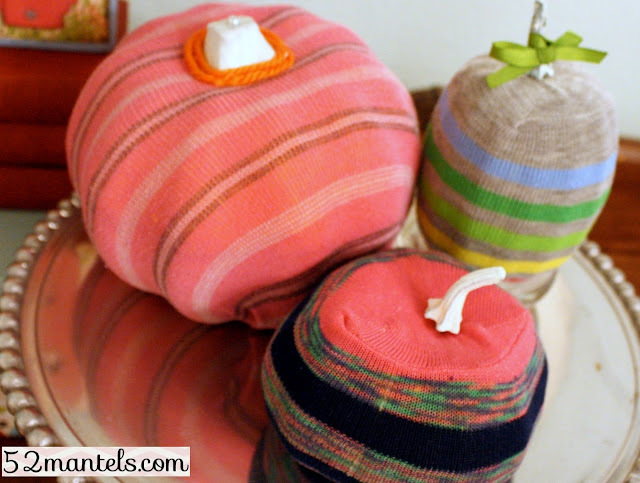 I made some sock pumpkins after seeing this blog! So creative. I am now following. To the lady without a mantel... An kinda ledge would be ok. A cabinet, armpit, dresser or piano top would serve as a surface to use these fun inspiring ideas! to create my own site and would love to learn where you got this from or just what the theme is named.